artist scott scheidly of florida, USA, had developed portraits for four notorious or influential public figures of the 20th century with an emphasis on their more feminine sides. 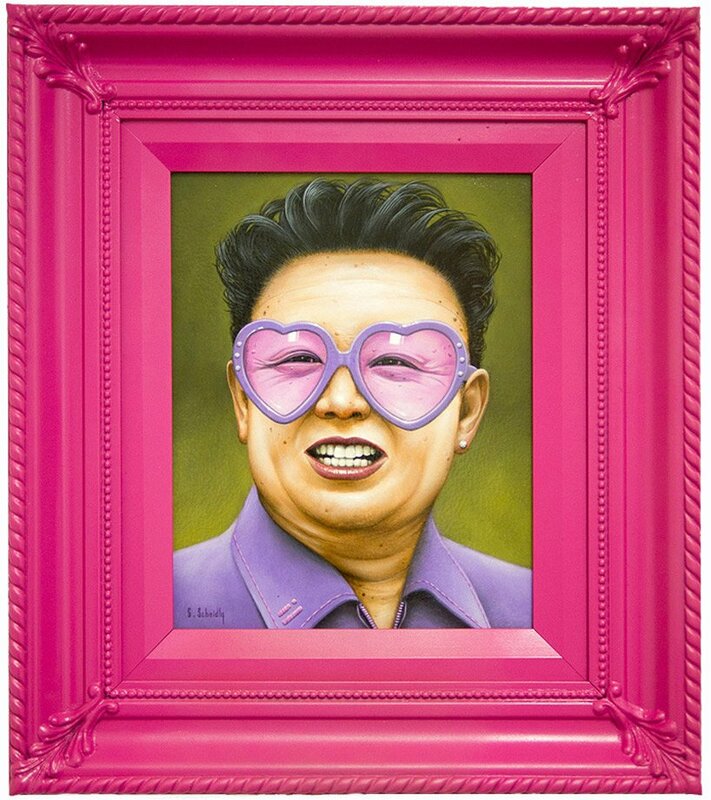 adolf hitler, kim jong-il, joseph stalin and pope john paul II have all been re-imagined by scheidly in shades of pink and purple outfitted by accessories such as dangling earrings, jewel uniform detailing and leopard print scarves complimented by hearts, flowers and unicorns. the series is the artist’s painted reinterpretation of these feared/revered patriarchs as he substitutes their hyper-masculine attire with objects, symbols and colors that are considered hyper-feminine. though the viewer may recall the horrible achievements of these men when gazing upon their likeliness, in this instance, their typical portrayal as being uncompromising beacons of masculinity and the centerpoints of ruthless regimes has been undercut by juxtaposition of lightened shades while still pictured in their classical portrait poses. scheidly’s painted series attempts to highlight the single dimensionality of a lone, patriarchic person in power– those who have subjected millions of people to their tyrannic rule without breaking his starkly masculine exterior– by introducing their undeniable humanity or duality in giving each male figure of power a layer of feminimity to contrast their typical portrayal. Being very sceptical about the concept of religion in general but being raised in a catholic country I see how being critical about many positions of Giovanni Paolo II and the catholic church is appropriate, espescially the pursue of ancient sexual moral. However there are no \”ACHIEVEMENTS\” of GP in this field, he just continued the traditions. I dont really get the point where one could compare him to kim jong il, hitler or stalin in any way, dictators who did no good whatsoever in their times. Even with an extremely critic eye he cannot stand uncommented within the biggest mass murderers of human history. I dont see the point the artist wants to make and as he doesnt seem to have anything to say about it (also on his website) I assume its just some superficial and despensable cry for attention with some unreflected pseudo art. In my eyes it has some homophobe tendencies or what do you want to say? Calling kim jong il, hitler, stalin and giovanni paolo \”GAY\” like some unreflected pubescent bully, seriously? though i am a bit skeptical about this concept as well, i don’t think the artist is necessarily calling these leaders ‘gay’ in a pubescent, bulling manner. to me, this series further makes ridiculous the horrible things these men did in their time on the earth as the artist paints them as individuals with duality or depth, stripping away a bit of the villainous lens through which we typically view these individuals by infusing femininity into their portraits. the series definitely highlights the ridiculousness of patriarchy and the rule of one individual with a huge group of people subjected to their tyranny without having room for other ideas, other ways of existence or room for critique. Missing the Israeli and American portraits. Depends. Which American and Which Israeli? Shure (and I feel extremely awkward defending a pope) theres a lot of due criticism on catholicism and most religious leaders. Still comparison is hard between \”Patriarchs\” that actively had killed millions and a religious leader that of course influences Millions in their life decisions but has no active political power whatsoever. Maybe there are just a few more Patriarch/Tyrannic/Religious Supervillain Leaders that maybe made the world a worse place missing in the Series, heres an uncomplete list to select from: George Bush, George W. Bush, Tito, Mussolini, Franco, Benedetto, Maggie Thatcher, Gadhaffi, Hussein, Ali Chamene\’i, Netanjahu, Ron Hubbard, McCarthy/Hoover, Jesus, Mohammed, Che Guevara, Castro, Leopold II of Belgium, Hu Jintao, PolPot, Mao, Pinochet, Botha, Putin, Nijasow, Musharraf, Assad, Abdullah Saud, Berlusconi, Ahmadinedschad, Ahmad al-Baschir, Mugabe, Taylor, Honecker, and so on. mediocre work parasiting…otherwise an irrelevant pinkish piece of paint. But doesn’t the pope’s opinion on gay people, people of other faith systems (ie non-christians), women’s health and reproductive health issues make him somewhat of an active political influence? I mean, his opinion as the voice of the church guides many leaders to commit the crimes against humanity over the years… The church’s power is anything but passive in world politics (in the past and present day). He holds the last word on many ‘moral’ issues and he is clearly THE position of power in a male-ruled system (the catholic church)… scusa, but I think PJPII fits in this list. Hilarious! The heart glasses on Kim Jong Ill! You include Jesus in your list of \’bad people\’. What for exactly? This is not “Hitler” on the painting: it´s obvious only a still from a movie -> the “Hitler” from Tarantino’s “Inglorious Bastards” ! Sixth grade thats exactly the point I wanted to make, a good description of scheidlys work. Like his other pseudio dalì esque stuff. Another artist (always wrong to call yourself an artist in my opinion) with some semi reflected work asking for public postrationalisation. @Douglas its interesting you ask why I added Jesus but not why I added Mohammed…Christianity was the root to some of the darkest parts in human history so Jesus must be considered the root of the evil and the patriarchal system of catholic church. In case you dont know what I am talking about I\’d suggest you get some extra history lessons. I am not defending christianity/pope/patriarchy, just criticising semi reflected waste of paint. Apparently scheidly googled for hitler, found a still from inglorious bastards and didnt even realise it …… please get history lessons. And spare the world your surrealist mushrooms that used to be new a hundred years ago. Love the idea. I’m not getting the inclusion of PJP II though. Interesting idea. Don’t understand the inclusion of a Pope? speaking of tyranny—what about this: According to the Aspen Art Museum’s recently mailed annual report: “In the sixth year of the groundbreaking Aspen Art Museum and Aspen Skiing Company partnership, the duo presented unique collaborative projects that celebrate the shared vision of art in unexpected places.” Cough. Aspen Skiing Company has fired a singer [Dan Sheridan], banned his song [Big Money], censored a newspaper [Aspen Daily News] and banned a whistleblower under threat of arrest [Lee Mulcahy PhD] from all company property, including leased National Forest. A local man wants a judge to void the Aspen Art Museum’s ban that prevents him from stepping foot on property owned by the institution. Lee Mulcahy filed a lawsuit against Heidi Zuckerman Jacobson, the museum’s director and curator, in Pitkin County Court on Thursday. The lawsuit, which seeks $250, says his ban from the museum’s future location, an empty lot at Hopkins Avenue and Spring Street, is unconstitutional. The artist and former ski instructor apparently ran afoul of the museum in November. Detractors of the museum’s relocation into downtown hung “For Sale” signs on two tractor-trailers at the future site. The museum’s manager told police that he had video footage of Mulcahy hanging the signs, according to an officer’s report. Mulcahy’s lawsuit against Zuckerman Jacobson contains a letter to The Aspen Times from Aspen resident Richie Cohen in which Cohen admits to hanging the “For Sale” signs. The court filing also mentions Zuckerman Jacobson’s comments to the Aspen Daily News about the vandalism. She said in November that the museum would be installing lights and cameras on the new site to deter similar acts. She also referenced the signs on display in New York City subways — “If you see something, say something,” she said at the time, encouraging people to call police or the museum if they witness suspicious activity. “To protest this treatment of the community, the plaintiff created an art piece, wrote a letter criticizing [Zuckerman Jacobson] entitled ‘Criminal or Hilarious?’ and … painted ‘Meet the Art Police,’” Mulcahy wrote in the court filing. He was later told that he had been banned from the vacant lot. Mulcahy, who on Wednesday filed a libel lawsuit against Aspen Skiing Co. CEO Mike Kaplan in connection with the plaintiff’s dismissal from the company in January 2011, cites the First Amendment in his suit against Zuckerman Jacobson. The amendment “is designed to protect artistic and other expressive activities from petty tyranny,” the lawsuit says. Asked for comment about both lawsuits, Mulcahy late Thursday sent an email containing quotes from former national security advisor Zbigniew Brzezinski, Martin Luther King Jr. and Frederick Douglass. He did not respond to additional efforts to reach him Friday. Because of the museum’s nonprofit status, Mulcahy apparently considers the future site to be public property. Dieser Beitrag wurde unter Allgemein, Klage abgelegt und mit Aspen Art Museum’s ban, Most ridiculous Lawsuits, Nietzer&Häusler, petty tyranny, protect artistic, punitive damages, rechtsanwalt amerikanisches Recht, US Recht, Wirtschaftskanzlei Heilbronn Franken verschlagwortet. Setze ein Lesezeichen auf den Permalink. [“Artur Żmijewski (born 26 May 1966 in Warsaw) is a Polish visual artist, filmmaker and photographer. During the years of 1990-1995 he studied at Warsaw Academy of Fine Arts. He is an author of short video movies and photography exhibitions, which were shown all over the world. Since 2006 he s artistic editor of the “Krytyka Polityczna”. “If artists should be honoured to be hosted by a museum, there is an idea of culture understood as a form of entertainment.”-Maria ROsa Sossai, Art critic and curator, Rome. “Getting beyond individualism means to starting to exist politically, in a form of solidarity capable of opposing the utraliberal dictates that usually govern the art world.”-Laurent Faulon, artist, Rome.